"Big Bucks of the Year"
Trophy hunter Zane Lindsey from Etowah County AL arranges his vacation around when he believes the rut to be. He timed it pretty good in January 2012. Zane hunted well traveled trails in some of the thickest habitat on the lease. The shooting lanes had been prepared as much as a year earlier. Zane took these trophies on 3 consecutive days. The wide eight pointer on the left scored over 120, the nice nine on the right nearly 140 and the giant in the middle scored more than 140 inches. That is bound to be three days Zane will never forget. Well done Zane and congratulations on a season of a lifetime. 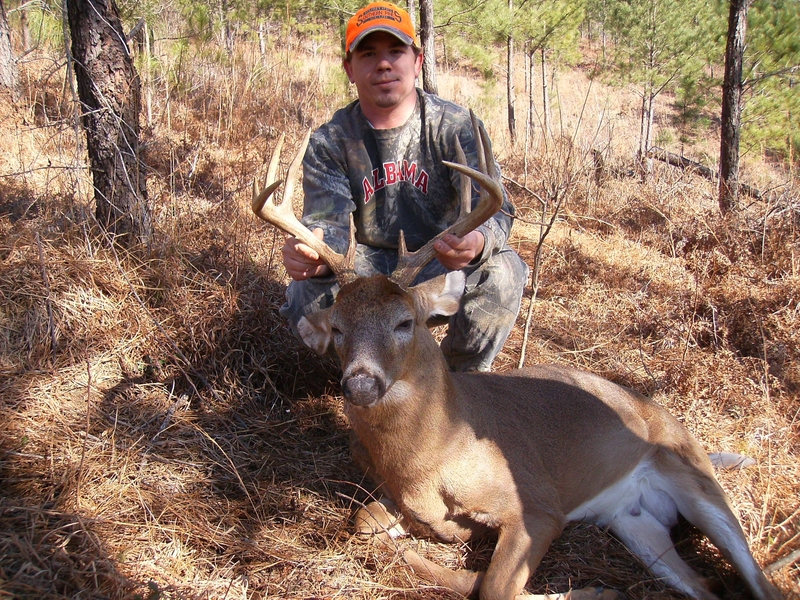 Travis Howie started hunting at Southern Pines Hunting Club while a student as Auburn University. After graduation his work carried him back home to the Gulf Cost. 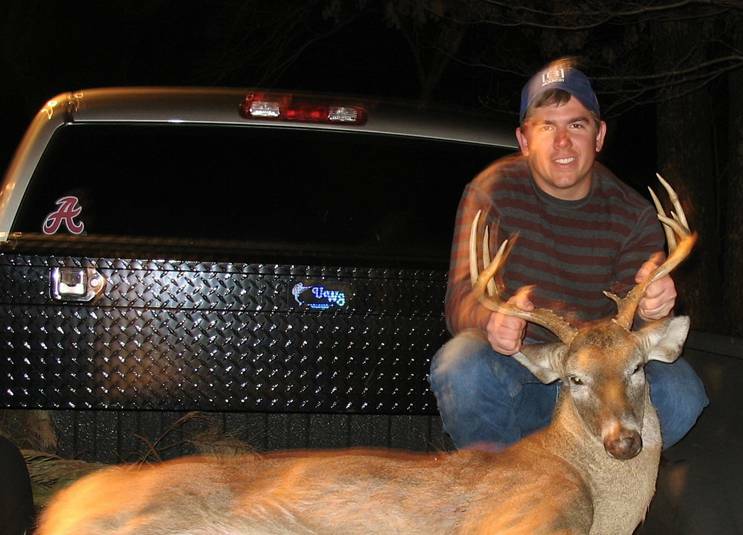 Now a married family man Travis does some of his hunting close to home on a family farm but he still makes the times to drive north especially during the January rut because of the quality of bucks he has been able to harvest here. The nice 8 point buck pictured above was Travis's 2nd big buck of the year at SPHC. Congratulations Travis. How could that happen? What are the chances? Unbelievable! Any or all of that could be used to describe the fact that Taylor Beddingfield and David Hare repeated last years feat by claiming our clubs big buck of the year honors for 2009/10. Consider this, in our club’s 16 year history, prior to this year only two members had taken the clubs big buck twice. No one had ever taken it three times. 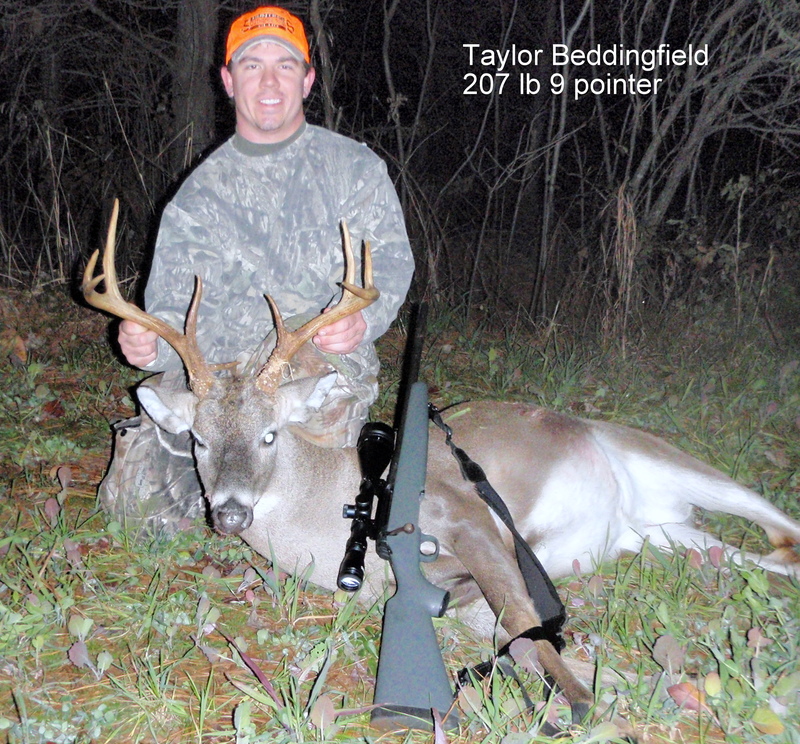 Taylor Beddingfield in his 6th year in the club has now taken the club’s big buck 3 times. David Hare in his 2nd year has shared that honor both years. In those two years, Dave has killed 4 trophy bucks by anybody’s standards. Folks, that is impressive. Prior to last year we had never had co-big buck honors. In both the 08/09 season and the 09/10 season Taylor’s and David’s bucks were too close to call. All four of the trophy bucks were more than worthy of the honor. The fist year Taylor’s deer scored more antler inches. Dave’s buck was close in inches but had more body weight. The next year just the opposite happened. “To God be the Glory”. Taylor said “don’t write a word about me without giving the LORD JESUS CHRIST the credit for anything good that comes from my life”. He said ”that includes his hunting success”. Taylor Beddingfield on the left became our club's second member to repeat "Big Buck of the Year honors. Taylor killed this fine buck from a natural ground blind. Taylor is also our youngest Big Buck winner. He was only 20 years old when he kill his previous big buck. 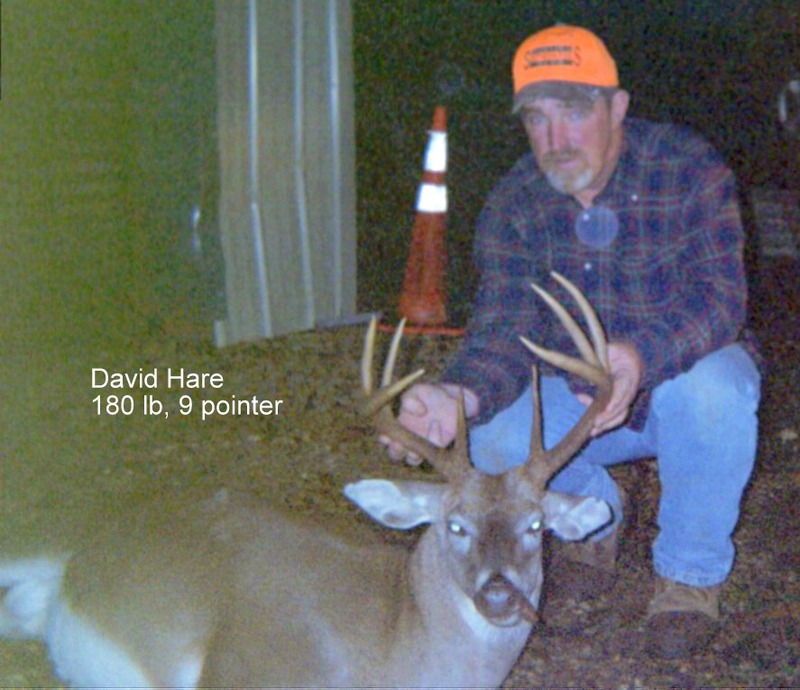 David Hare shared the club "Big Buck" award in his first year in the club with this great crap claw buck. David also earned "Hunter of the year". In addition to the Crap Claw buck he took a couple of doe, a wide racked 8 pointer and a 9 pointer with double main beams on one side, double brow tines on the other and coke can bases. Congratulations Taylor and David. 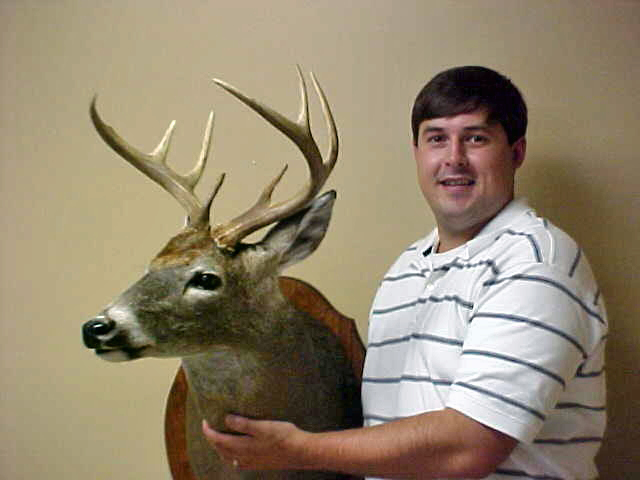 Travis Howie of Mobile AL became our 4th hunter in a row under 30 years old to claim our Big Buck of the Year award. Travis will be adding this fine 8 pointer to his trophy room beside the big 10 pointer he took last year. Travis saw 6 mature bucks one morning last January. Nathan Beddingfield made it two years in a row for the Beddingfield Brothers. 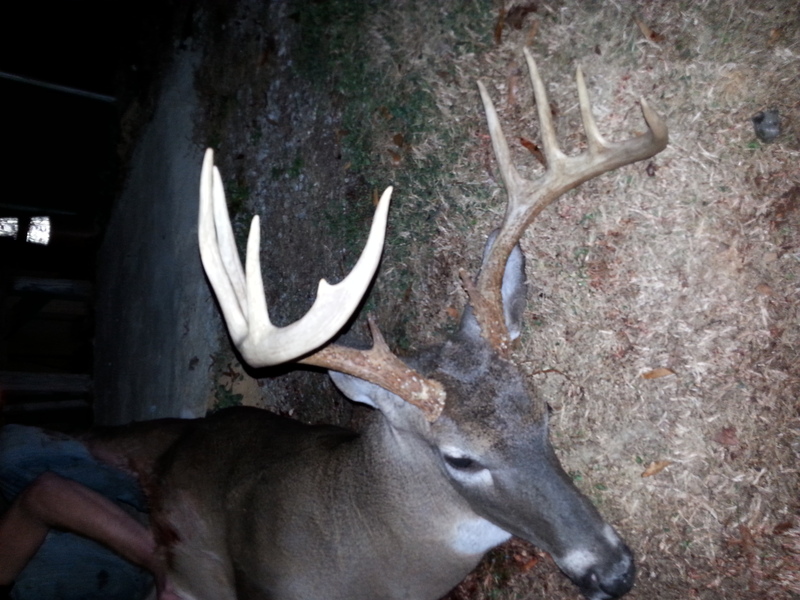 Nathan's 210 pound giant came on opening morning of gun season. Our mature bucks averaged 185 pounds this year but Nathan's is our heaviest ever. 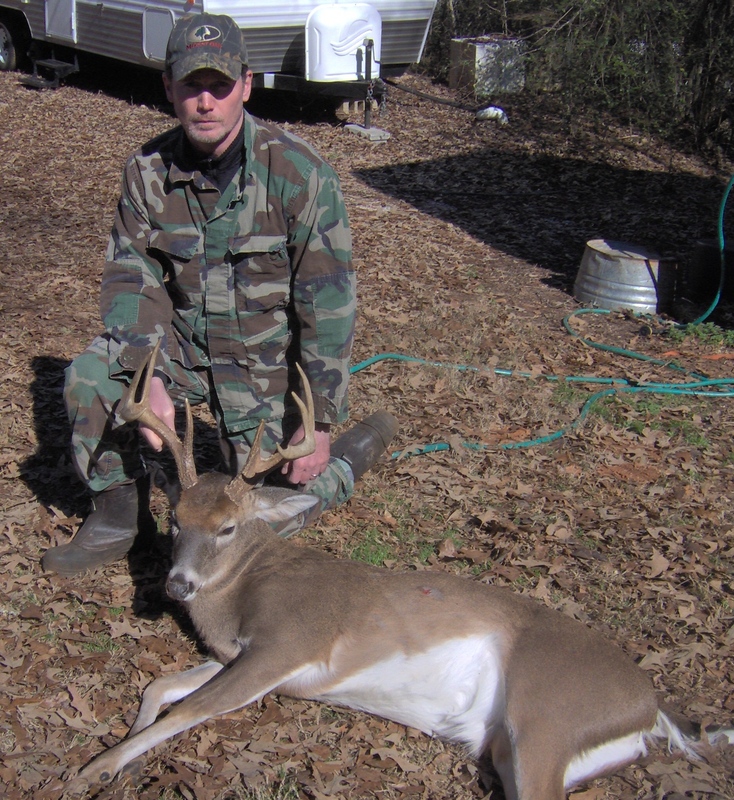 Congratulations to Nathan for another outstanding Southern Pines Buck. Twenty year old Taylor Beddingfield became our 4th new member in the last six years to harvest our club’s big buck of the year. 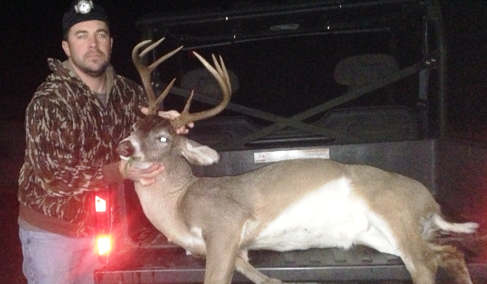 Taylor’s trophy was taken on the last Sunday evening of the season. Taylor, a very talented and dedicated hunter had seen this deer earlier in the season running with a big 10 pointer. Taylor was our youngest member ever to win our big buck award. We know for sure this will not be Taylor's last great buck. Rookie member Kyle Reeves, one or our avid bow hunters took a day off from archery hunting and harvested this nice buck with a rifle from a stand overlooking some scrapes. As Kyle was coming down from his stand, a larger buck also showed up. Good job, Kyle. 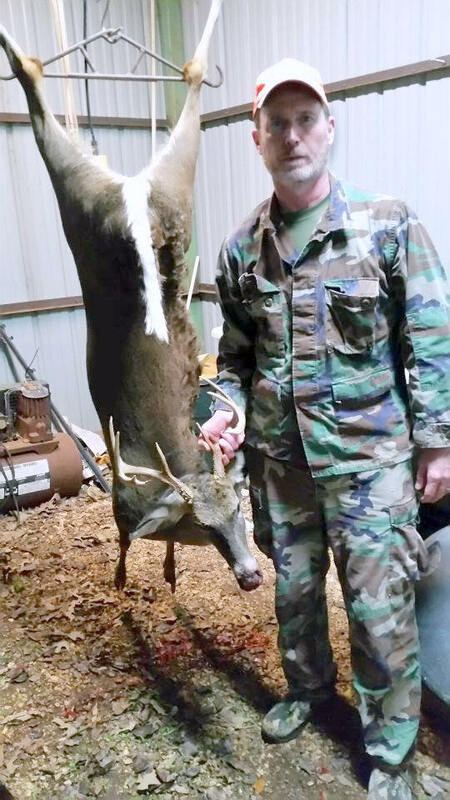 Steve Glisan one of our veteran hunters with a mature 9 pointer he harvested in the trophy area of the club. 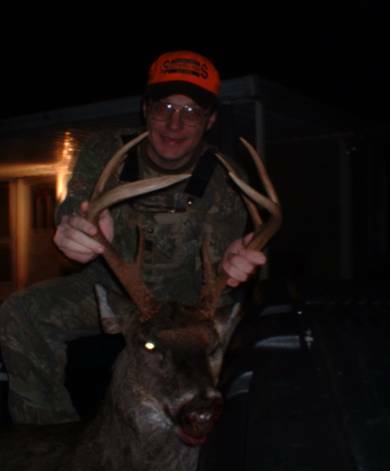 A story on Steve's kill was our second to be featured on the Buckmaster's Web Site. 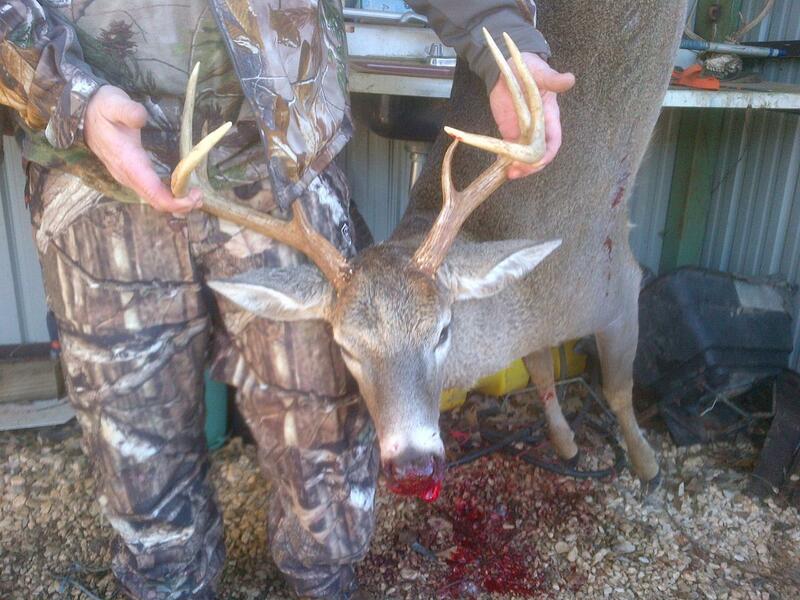 The "Big Buck" has been take from the trophy area every year since the area was established three years ago. Steve adds this to his many trophies including several exotics. Mack Morris and the 8 pointer he killed in area 9 of the trophy area. This mature deer walked out into a greenfield during mid January. 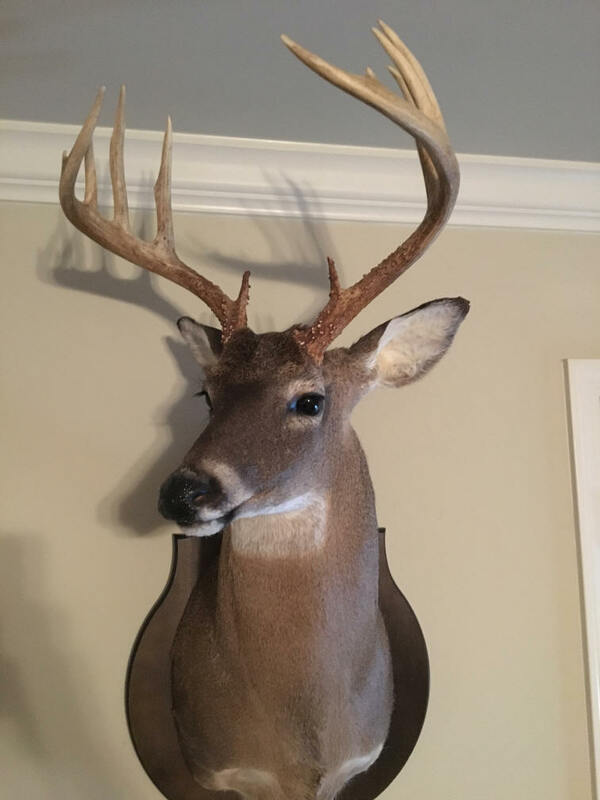 The story about Mack and his deer was featured on The Buckmaster's Website. Mike Lincoln with the "Coosa Moose". 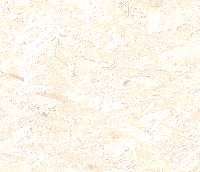 The "Moose" had 14 scorable points and measured 154 7/8 Boone and Crockett. 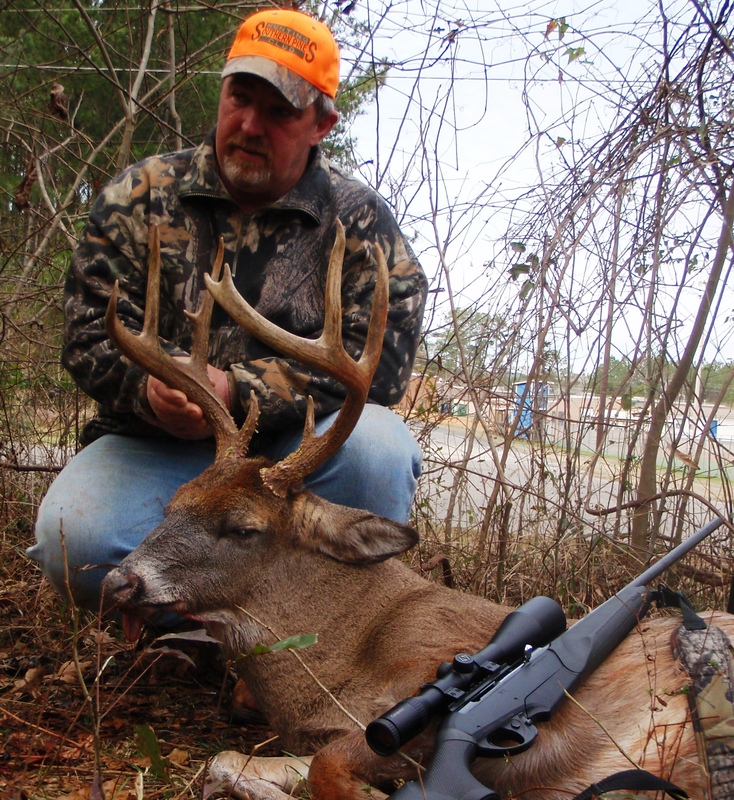 A feature article "Before and After Buck" by Joe Glover was published in Outdoor Alabama Magazine about this great buck.